Enjoy a game of football at La Garangeoire Campsite. Have a go on the waterslides La Garangeoire Campsite. You'll be pleased to hear there's a beach close to La Garangeoire Campsite. Enrol the children at a children's club - and you'll get some time to yourself. Worried about the temperature of the outside pool? Don't be, a covered pool is available at La Garangeoire Campsite. Need a little pampering? try the Spa at La Garangeoire Campsite. La Garangeoire Campsite has plenty of areas for you to explore. Want to have a closer look at La Garangeoire Campsite? 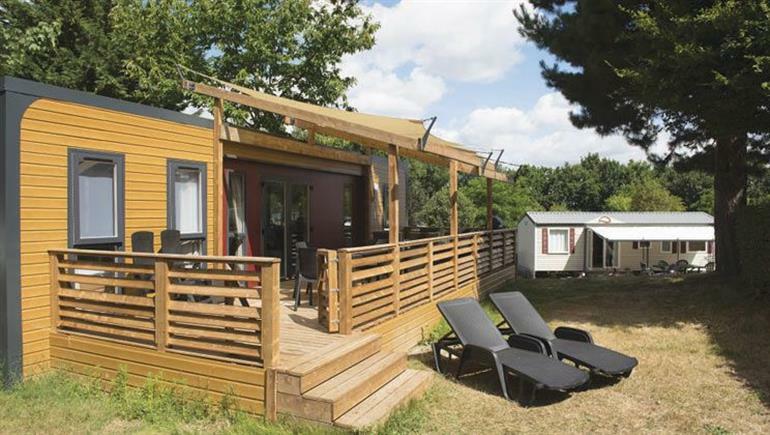 If you think La Garangeoire Campsite in St Julien-des-Landes, Vendee is the holiday park you, why not have a closer look, and check out prices and availability. La Garangeoire Campsite family holiday park has 356 pitches. Eurocamp have family holidays parks all around Europe. 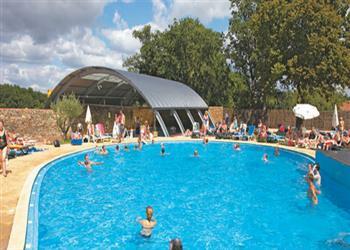 La Garangeoire Campsite (VS011) is just one of the family holiday parks in St Julien-des-Landes, Vendee, France. Have a look for other holiday parks in France. You can also see what other people though with the reviews of La Garangeoire Campsite. These are the reviews for La Garangeoire Campsite. There are 150 reviews. Great site in a nice area. Will return but probably not for a few years. I was very disappointed to find out that the horse riding instructor had gone on holiday - that was the only reason I chose that camp. . I emailed eurocamp to ask how to book the riding lessons /days to be told I have to do it when I arrive, we carried all my daughters rising equipment by plane and I was very annoyed to be told that she wasnt able to do any at all. . parc was good but not many activities offered - I was continually been told "well it the end of the season". Great site, clean firendly and plenty to see and do. great for kids and families of all ages. lots to do in the lcoality. . thank you for a great time. Fabulous holiday, wonderful campsite with plenty to do for children (ours aged 5,9 and 12). our first time at a eurocamp and I am very impressed. The campsite has so much to offer and is a lovely safe environment for children. The staff are extremely helpful at all times. There are fabulous places to explore near the site to. 1st eurocamp holiday, did a lot of research to find best site for key stage 1/key stage 2 children. don't worry about being 10 minutes from the beach the drive is easy and the beach car parks are free, also lots of things to do on site, went last week before schools went back and got big saving. Site and beaches quiet as french children back at school but weather only slightly warmer than uk. Super campsite with plenty to see and do. Good break in a lovely area. Our need to escape for one night from approaching bad weather and our tent was accommodating with ease and efficiency by the site team in liaison with the uk. An option other operators seemed reluctant to take up. The loyality discount was an extre welcome bonus. This is a great parc with lots of amazing activities for families to enjoy. The caravans are very secure and cleaned to a high standard and the parc is a safe environment for young children. Great site for children with lots to do. A good play area and pools, with the new lagoon pool very safe for younger children. The fact that the pools open any 9.00 is very useful for adults wishing to swim before the pools become crowded. all of the campsite staff were very helpful. We had a great time and will likely be returning. We stopped in at garangeoire for two nights at the end of august. Unfortunately we were a little disappointed on this occassion as we found the campsite staff a little grumpy and unwelcoming. Some of the facilities that led us to booking this location were also unavailable to us during our stay or were difficult to access (brochure says go-karts everyday 4-7pm although admittedly this is only until the end of august. No obvious mention of this on the eurocamp site though and we only found out after visiting the track and finding it closed sign inside still read 4pm-7pm …). the pedalos can't be pre booked as they are free for the 1st hour. We missed out on these at first visit and were then told to return in 40 minutes which we did only to be told they were unavailable again. Surely a waiting list system with a deposit could be introduced to save guests wasting their time. We went to order food from the bar at 13.50 but were told the kitchen was shut (even though the menu says food served until 2pm). perhaps it was due to it being the end of the season that the staff were unwelcoming but it did spoil our stay slightly and I don't think we'll be going back. On the plus side the eurocamp couriers were very friendly and our caravan was very nice and clean. Only slight negative was that we didn't have any saucepan lids so I had to improvise with cooking rice. I rang the couriers and left a message but never heard back. This site is fantastic. It offers everything you could want from a family holiday and then some. Go carts, boating, crazy golf, great park, pools, a lagoon, pony trekking, archery and loads more. It is a very family inclusive park with something for everyone. Reception staff were very helpful too with a great knowledge of the local area and some discounts when booking activities through them. Kids clubs were very good too. . the site is very pretty, nice and flat (great for the kids on bikes). it's also very quiet at night. The lagoon is a fantastic addition - sand and water without any danger for small children. . our accommodation was decent. Caravan was clean and the pitch had some sun. From looking around I think this was probably one of the worst pitches on site and it was still pretty good so no complaints there. La garangeoire is a fantastic campsite and we will certainly return but not with eurocamp. We were grandparents holidaying with our daughter, her husband and three children. Last year we stayed with eurocamp at the same site and as requested were placed in adjoining caravans. Having had a wonderful holiday in 2014 we booked for 2015 while we were still on the site. Again we asked for adjoining plots so that we could help with childcare. I rang eurocamp several weeks before our holiday and also sent an e-mail to remind them of our need to be together. I know you say that you cannot guarantee this we felt that as we were staying for 17 nights and with 12 months warning it should be possible to meet our request. When we arrived we were very unhappy to find that we had been placed nowhere near our family. Eventually after 3 days we were moved to the adjacent caravan. It was too late, my view of eurocamp was ruined. Having sung your praises for the last year I am now telling a different story. It was our second visit to the site and we were not disappointed. We all loved the lagoon - a great addition. 3rd time at this park and would definitely go back. Lots to do and friendly/ helpful staff working there. Very family friendly. Felt right at home. Kids had a great time. The camp was excellent for our grandchildren 6 and 8 tears. very safe and friendly. Lots to keep them amused especially with the gales and rain which did marr the holiday. the area has little to offer in poor weather. it really is a beach holiday so you need it to be sunny. We enjoyed another holiday at the parc. lots to do on site and loads of places to visit locally! We had a great time at la garangoire. The weather the second week was pretty dismal which meant we were limited in what we could do which was a shame. The facilities on the part are excellent and in our two week stay we couldn't manage to do them all. Our 7 year old son learnt archery. I took part in yoga and both our 7 and 5 year olds enjoyed the euro camp kids clubs. The highlight (on the sunny evenings) was sitting in the walled garden whilst the children made friends and played on the bouncy castle. Most guests are british and all the staff speak english so if you are after a very authentic french experience where you practise your french this might not be ideal. We would definitely go back but the weather was literally a dampener! Very enjoyable holiday somewhat sullied by a very wet second week. A great park, with wonderful staff and facilities. the eurocamp staff could have been more cheerful and the accommodation felt rather like a friday afternoon job! The parc was recommended to us so we went with high hopes but even they were surpassed. We loved this parc and most importantly, so did our boys of 6 and 3. Great place. Terrible weather in second week which brought home how little there is to do in vendee when weather bad. Site was absolutely superb especially for younger children. This is our second year at this site and there is very little to fault. there was a lack of space for clothes in our accommodation, but everything was clean and in good working order. we did not have much experience of the couriers, however they were efficient and friendly when we did. the camp staff were very helpful with booking tickets for poy du fou (highly recommended - our 8 year old loved it) and both off site and on site information. archery teacher was particularly good. an excellent camp and I would highly recommend to anyone with children. Brilliant parc!! has all the facilities you need to keep little ones entertained. Unfortunately our caraavan was at the start of the park so we had all the passing traffic so at midnight you could hear everyone's conversations but I would def go back there just book a different spot! the grand defi is a must if you go it's fab and great value for money we spent the whole day there and it was just brilliant! the go karts were brilliant and so was the new lagoon and so safe for kids! the restaurant was just gorgeous it was such a shame the weather was rubbish last few days. The take away was great and a real hit. Brilliant place! Beautiful forest location. Clean environment. Good facilities. Friendly staff. We largely 'did our own thing' - so difficult to comment on certain aspects of parc. A lovely parc which gave the kids so much scope to roam in a very safe environment. Had a good thoroughly enjoyable holiday it was not as long as I would have liked but the staff at la garangoire were delightful and although they spoke perfect english, seemed more than happy for me to practice my pigeon french with them! 3rd visit, with grandchildren, certainly go again. The site is a fantastic site for families. Loads to do and lovely restaurant and take away. Our 3rd year here so I do recommend it. Our mobile home was a bit older and slightly tired but a good lay out. Fantastic site, great safari tent with plenty of space, this is camping at its best! We had an excellent holiday, really enjoyed everything the park had to offer. Our only issue was that our safari tent was quite a trek from the toliet/shower facilities. Amazing family holiday. So brilliant we have already booked up again for next year. Wonderful campsite , huge pitches and great things on offer for adults and children. I loved the free aqua aerobics and the kids loved the swimming pool and evening discos in the pool. The evening entertainment was super. Going again next year. Perfectly situated a lovely parc to explore. We enjoyed the circus. The local area is lovely. There are some lovely beaches around. The parc itself has a wonderful lagoon that the boys really enjoyed. Fantastic parc, fabulous couriers, awesome kids club. A beautiful site with so much to do. We stayed in a safari tent for 3 nights to have a 'taster' of what eurocamp would be like. We had a pitch at the back of the site bordering the forest /lake area which was lovely - close to shower blocks and amenities whilst also being bit quieter. There was so much for us to try and do in short time but peddaloes on lake (free! ), swimming in pool, the new lagoon (great for 2 small children), go karting etc all kept us busy. Didn't need to leave the site. We hope to return for longer next year as had such a good experience. First time ever used eurocamp and not disappointed once with what we received, from ferry to parc and accommodation. have already booked for 2016. Great site with lots to do. Parc excellent. Easy booking and helpful reservations staff and couriers. But accommodation in avant home which we expected to be better and bigger than the excellent units we have booked in many past years was very disappointing - less space inside overall and very little storage and wardrobe space. We had a lovely holiday in a very picturesque campsite set in a stunning location. Lots of enjoyable activities and high quality service throughout. I do think the pool was a little disappointing compared to the rest of the site but the new lagoon went some way to making up for this. I have contacted the site to give them separate feedback on this issue. However would recommend in all other ways. The facililties in caravan are basic but functional but the overall site facilities and staff are excellent and we look forward to returning next summer. thanks to everyone! La garangeoire is a great site and the eurocamp team on the site were very, very good. We had an avant which was less like a mobile home and more like an apartment - it was really modern and well decked out, with roomy bedrooms and the full size deck was brilliant. The only issue was the size of the plot - a bit small. Over all a good holiday with plenty of activities for the children. La garangeoire is a lovely site with loads to do, and very well looked-after. the staff are friendly and helpful and it is in a fabulous location. Great facilities at the parc, something for all the kids and adults. accommodation a little crowded so some noise in the evening from nearby neighbours (but nothing after 22:30). First time to this type of holiday so nothing to compare to. The camp and holiday was very much enjoyed by my children. The camp is very child friendly and affords you the opportunity to experience the weather and food of another country without immersing yourself in a foreign culture. Great park, loads to do, lovely atmosphere. The only down side was with the accommodation. The mattress on the double bed was awful and I didn't get a single good nights sleep, waking up every morning with painfull hips. I challenge the owners to sleep on these beds and realise how bad they are. A comfortable bed is a basic expectation that the owners should ensure they provide this. Fantastic holiday on an amazing campsite which has literally thought of everything! This was our first eurocamp holiday and already thinking of returning next year. our young children loved it. This parc was perfect for our family holiday. We stayed in a safari tent, which was brilliant! with so much to do on site, but also a short drive to fabulous beaches. Our 10yo & 6 you enjoyed being involved in the kids club a few mornings, then go karts, and archery. The pool was a little crowded, but great for a dip & slide late afternoon. The stables were well run & my 6yo enjoyed the pony games there. after a busy day day we enjoyed walking the short distance to the clam of the lake. the lagoon is a great addition to the parc. The site offers a wide variety of things to do all week. we all enjoyed the garden party with games and crapes. We met some great people on site too. . Overall the holiday at la garangeoire was very good. Excellent parc with friendly, attentive service. Lovely big pitches, lots of showers and facilities. Pool was good, we even got a sunbed each time we went (in july/august!). the site is big, and very english. Brilliant, weather not great but better than at home. Unfortunately it rained for a couple of days, but not much anyone can do about that. great site with loads to keep the kids entertained day and night and will definitely be returning. Excellent parc with really helpful staff, I didn't score 10/10 as the staff didn't deliver our pre-ordered essentials pack until we reminded them of it. Good facilities and lots to do, particularly liked the lagoon option as well as the pools for the kids. This parc is excellent in every aspect. We stayed in an esprit, 3 bedroom 1 bathroom. Pitch size was generous. Lots to do at the parc and we enjoyed the beaches. We were unlucky with weather, it was a bit chilly! We had a wonderful 10 day holiday at the park even though the weather was hit and miss which was a shame but we had such a great time that didn't spoil our experience. We stayed in one of the safari tents on the site. This is a lovely family friendly site and very clean and well run. Loads of activities to do especially for the kids. Enjoyed the archery and tennis with eric who was very good and I enjoyed a few games with him. They also do a tennis tournament once a week (which I won may I add!) special mention about eurocamp especially stacey the site manager who was excellent as was her other colleagues. It was my 40th birthday while I was out there and I was presented with a lovely bottle of wine, card and a funny present from the eurocamp team which was nice. Overall apart from the mixed weather we had a great time and we will return. The parc was great with lots of activities for the children, the pool and lagoon were clean and well maintained and not too busy, parc was quiet after about 10. We found the staff friendly and helpful. The location was great for a lot of beaches, markets and days out. Overall a great parc in a lovely location. Only real issue we had was with the beds in the caravan, these were camping style and were very uncomfortable, esp if you struggle with your back etc. This was my second trip with eurocamp though my husband went many times when he was a young boy and has many fond memories. The campsite is really lovely, the pitches are not massive but they are separated by hedges. It is a lively park so if you're after peace and quiet then this isn't for you. There are loads of activities at the park to keep your little ones entertained, mostly free. The shower and toilet facilities were clean and we never had a problem getting a cubicle. The shop is well stocked and reasonably priced, it was lovely getting your croissants there in the morning. The takeaway was good though there is a limited choice, pizza, chicken nuggets and chips for the kids. We loved our time at this campsite and already booked to go back again next year. Fantastic park, it was a pity that we stayed in a mobile that had not seen a cleaner for the season, the decking was broken, not good because we had a child and a dog, the decking also had weeds growing through it although this was sorted once we complained. The mobile was dirty throughout with things like sweet wrappers under the beds from previous occupiers. The eurocamp couriers helped as much as they could but the accommodation should have been sorted beforehand. As previously stated the park was fantastic and as such we have booked for next year already. But I would like to say to eurocamp, pull your finger out!!!. First time with eurocamp, travelled with husband and my brother and his 2 children. Large parc with great facility's ie swimming pool, playground, open spaces, various activities and evening entertainment. Restaurant and bar were great. Shop was small so went out to supermarket. Close to beach but need to drive. Beautiful site that is well and truly made for families. We were so impressed with the pools and facilities and the campsite restaurant is phenomenal. Park is in a lovely peaceful spot. Perfect place to relax and chill. Caravans are well appointed. Kids club activities was aimed at lower age children so our 12yo was bit bored at times. Otherwise didn't see any eurocamp staff. Good facilities but quiet so ideal to relax. Our 2nd year here and would like to go back again! All in all a really enjoyable holiday. The site itself is nice and had great facilities, and the owners are very friendly and can't do enough for their visitors. We had a couple of disappointments with the accommodation, but as always the kids' couriers and activities made the holiday for our little boy, and happy toddler = happy parents. . the region was a real revelation for us - didn't know much about it before visiting but found it to be an interesting, welcoming and relaxed place. Standards have dropped this year, the welcome packs used to include a bottle of milk not powdered and the linen pack did not include hand towels. Only two pillow cases were provided when there is four pillows. Eurocamps are still good value but, the drop in standards means we will make the move to gites. A great sight for young children our first try with the daughter and her children and husband unfortunately we had arranged flights from stanstead to la rochelle on asunday and found taxis rather expensive . if we go again may use our own transport on long sea ferry crossing to caen or san malo. Super holiday, with just a couple of niggles. Site was lovely; nicely laid out and great pools. bike hire was incredibly expensive. we were probably too far from the sanitation blocks (which were always spotless)..a bit of a hike with a tot not long out of nappies. Tent not fully equipped, eg plates, glasses, knives, bbq eqpt, etc..would have expected the amount of stuff to be correct. other little things, like fan not working and heater having a uk plug. however, all dealt with quickly. stove not faulty and staff unable to resolve that one. bbq pretty useless and incredibly uneven!. main gripe was the mini-club. part of the joy of mini-club with, for example, some other holidays, is that we can actually do something (swimming, sailing, etc). could see little point in putting the boys into a club and then have to sit in the vicinity (which only serves as a distraction for the boys anyway!). having said all that, site was lovely (although restaurant has fairly limited menu and was probably has the record for taking the longest to cook a rare steak..an hour!). . super beaches 15 mins away. 20 mile round trip to the supermarket. Excellent well run parc. Weather was a bonus! Excellent site - ann and eric are perfect hosts and their staff are a credit to them. Eurocamp staff were brilliant. The accommodation was lovely, spacious & well maintained. A small problem with the gas was rectified quickly. luke and his staff are to be congratulated. We have been very fortunate to have wonderful weather for a week away in france. Our boys (aged 2 & 3) loved the swimming pool and insisted on going down the slides on mummy and daddys lap. Our home for the week was very spacious and provided an excellent base for our holiday. We did run our of gas and had a very cold morning, but one of the couriers came and changed the bottle. I would recommend the site to anyone with young children, plenty to do and the bouncy castle became part of our daily routine. Fantastic site only thing preventing it getting a 10 was the fact that after the end of august they cut back on staff and we had quite long waits in the bar, take away and restaurant. Great parc with lots of activities. perfect for our kids. Enjoyed our holiday very much and wished we could have stayed longer. Campsite was brilliant. Will definitely return. This is a nice site for an entry level intro to the eurocamp world. I think I found the photos online slightly more "perfect" than what was actually on the ground - it was a smaller park than I thought it would be - I htought the chateau woudl have more space around it and be more of a prominent feature - not a lot of space between the caravans. . I also believe the strict "no noise" between 10pm and 8am rather harsh - 11 and 7 perhaps more reasonable. You have to remember that people are on holiday and will want to enjoy the evenings when the children are in bed. . found it odd that you couldn't prebook the pedalo/canoe and had to "take a chance" on that- also surprised that this was a free activity. . would be good to have signage to the go-kart area. We had a fantastic time at la garangeoire (near st julien-des-landes), we didn't want to come back!! the site does not feel huge but offers more than enough in the way of activities and your own space to relax. we never once felt crowded, though the pool side will obviously get busy on hot days! lots of sun beds available. . we had a eurocamp espace mobile home (3 bed, 1 bathroom) which we thought had ideal space and layout - the decking was superb (and bbq), we sat outside on the decking more than we sat in and enjoyed 2 bbqs. (which was free to use!) the mobile home was clean and tidy, though some things were still wet from being cleaned before we arrived. (glasses etc.) . . we were showed to our holiday home by the eurocamp rep and given a comprehensive and friendly run down of our home, the kids clubs on offer and site facilities. that was really the last time we saw any of the eurocamp reps, though we didn't really need them. . eurocamp runs their own kids clubs that our children did not go to (too much going on.. they didn't want to miss out on what we had planned!) we did feel the clubs were mainly aimed at younger (9 and under) rather than young teens. my children did attend one of the daily soccer training sessions run by the site team, looked ok but, the kids were not really bothered to go again. . the main swimming pool is big enough, with an under cover pool to spill into, if the main one gets too full or you want to do some serious lane swimming. we didn't use the tennis courts and archery but only heard good things about them. my son did go on a "how to drive" go-kart course run by the site team, which was very good value for the 5 euros and extremely good fun for him (and me!). . our only disappoint for us was that we didn't explore the local towns, we just didn't have time! we went to the market at bretignolles-sur-mer (on sunday morning) which was great (proper french experience) and then to a local beach which had lovely sand and appeared excellent and safe for families. . the site's staff all appeared happy and were friendly, especially enjoyed the bar areas and happy bar staff. the site seems to only attract british people which was a shame. . I think we will have to go back.. no reason not too! A fantastic place for children. Lots to do without leaving the site. Traffic flow past central area needs sorting as it puts pedestrians, cyclists and young children on foot in the same area. . pool area very well thought out. . would definitely return to this parc. . Excellent campsite and staff, let down by appalling weather! Great holiday, so much to do on the campsite. Would recommend. Third year back to the same site, still wonderful and so many things to do. the folk group were simply magical! We were unlucky with the weather this year as it was unusually cold which does taint one's overall ratings. Often felt damp in the cabin in the mornings and were unable to get the clothes dry. The camp was a very english enclave - nice in a way but also easy to forget one was in france! generous plot area around the cabin. Safe. Excellent shop. Expensive bar. Great pool - busy despite being coldish and hard to find a lounger available. Fabulous local beaches (wind break crucial). generally, a tasteful and thoughtfully carried out camping development. Overall - with good weather, I can see it would be excellent. So much to do on the site - a fantastic place to go with children. We had a great time despite them weather. We loved the overall feeling of the site. The description in eurocamp's brochure and website do not do this parc justice. The surroundings and location are beautiful, the facilities on the parc are wonderful and the atmosphere of the parc is so relaxed. A brilliant campsite. Our 3rd year and we will be back. a beautiful setting, immaculate parc and lots to get involved with for a the family. The campsite and safari tent were fabulous and made our holiday very comfortable and relaxing. even when it rained we were dry and warm. all facilities were clean and showers were always hot. pool was a good size with slides suitable for children and adults and we could always find a lounger. Kids enjoyed the playground and loved cycling around the parc. Area had some lovely beaches and we enjoyed exploring the area. Would definitely recommend and are thinking of returning! Lovely holiday. The camp had great facilities for the kids, including a 'learn to ride' bike class, trampolines, kids clubs, and a visiting circus. the pools and water slides were excellent. A thoroughly enjoyable holiday! we would definitely go back and recommend to others. Our third time on this parc and we're already booked to go back in 2015 - such a great time once more. something for everyone, kids made loads of holiday friends - can't speak highly enough! This was the second year we have been to this parc. We had a lovely holiday and cannot fault the range of activities on offer for us and our family. Our third time at this parc and it remains as good as ever. Great entertainment to suit all tastes. We had a lovely holiday in la garangeoire our second visit and we would come again. we were initially very disappointed in our accommodation but the couriers were able to rescue the situation and the holiday progressed well. La garangeoire is a great camp, it is not a huge camp and each pitch seems to have a good amount of space without being too close to your neighbours. There are plenty of activities on site without being in your face - if you didn't want to do anything you wouldn't know that there were things going on, but you can quite easily have days when you didn't plan to do anything and find that you actually do plenty. Kids clubs organised by eurocamp are also great. Third visit - love this site. The park was well spaced out and did not feel cramped in any way, the facilities look like they have been recently refurbished and the staff were very friendly. It was colder than expected but heated pools made up for that. Nice site. Loads going on all the time. Kids age 7 and 8 enjoyed themselves without even doing many kids club sessions or park activities because they were happy at the pool or cycling to the park to meet new friends. The parc is unquestionably excellent but our accommodation this year and the fact that we had to move twice due to an error by eurocamp ruined our break. A great holiday on this lovely park. so much space and loads to do both on the park and in the surrounding area. brilliant for both adults and children, particularly if you like tennis, table tennis, cycling and water activtities! our 4th time over the years! A brilliant holiday. The kids clubs were brilliant as were the numerous activities offered by the site. It was very friendly, safe and a fantastic place for a relaxing family holiday. Learn to ride was fab. Great holiday, parc, accommodation, shame the weather wasn't great. We had a good time, but weather not good whilst we were there. Couriers were young and not coping with volume of work well. Van was not as clean as eurocamp usual standards. Knowledge of local area was poor. Kids club couriers were unenthusiastic and children poorly supervised. I did not feel it was safe to leave my children there. Excellent holiday, eurocamp was exactly what I expected, no hidden nasties, instead a number of added bonuses such as a gazebo. Couriers were attentive and helpful. The campsite was well established, with good sized plots, separated by hedges, with a good atmosphere even out of season. Facilities were first rate and whilst it was a few miles from any established villages there were a number of walks on the site and a large lake nearby that was walkable. Overall very happy with the holiday. This was not one of our best holidays! . . we picked this site because we wanted to explore the area and in the brochure it was described as 'peaceful'. this site is anything but peaceful. it's brilliant for families with children of any age but with couples accommodated amongst young children it was far from ideal for us. . . we had chosen a top of the range mobile home; to spoil ourselves, but the one we were assigned to was surrounded by trees so that there was no sun at anytime of day and it was freezing cold; not ideal for a late summer break and not the ideal position to allow the outside in! we asked to be moved to another unit that did have the benefit of some late summer sunshine; there were no other units available in the price band we had booked and we were told that we would not get a refund but that was better than spending our holiday in the shade!. . we didn't find much of interest in the area at first; the couriers were focussed on kids entertainment, and there wasn't much guidance for adult exploration. for example, the woodland cycle trails were suited only to mountain bikes (and even then were dangerous for kids in places), there were good routes in the lanes around the site but we found these on a board at the local village. a detailed guide of how to get to lac jaunay would have been very helpful. . we would have chosen to travel later in september but eurocamp closed down on 9th september, whereas the site itself was actually open much later. we learned that the eurocamp 'team' were contracted to move on down the coast to take down tents at other sites; why not leave a single courier behind and keep some of the mobile homes open later?. . on balance we would go to this site again but would need reassurance that we would be accommodated in a more appropriate position. Lovely parc well maintained and very clean. Lots to do this would be great with slightly older children as its so active but we took our baby and still found it very family friendly. The parc is beautiful with great pools and lots of great kid friendly activities. We'll definitely go back. The pace was a lovely place. Plenty to do for young and old. The wifi was not very good, having to keep going up to reception and the bar, which wasn't very good. Also very hard to find when we arrived. The mobile home was clean and spacious and very well equipped. We stayed there out of season (first wk of sep), so we had an unrealistic impression of the place: quiet, sun loungers always free, no queues for anything.. it was lovely, although the downside of being out of season meant few children's clubs, etc. The 'chalet' was great and set amongst trees and hedges. Only twice did we hear noise that contravened the 'silence after 10pm' rule. We'd consider returning. I would have scored a 9 for the parc as it was lovely, but marked it down for the following:. 1. Pool was too cold, our toddler and baby got cold quickly so had to keep getting out and warming up. I was expecting at least the small toddler pool to be warm, but that was no better than the main pool. 2. We went in the first week of september - so end of season, and the toddler activities had finished. I would expect the children activities to end as they'd be back at school but thought you'd still be running toddler entertainment as that is one of the main reasons we choose la garangeoire. A really lovely parc set in a super location. The pools are a particular highlight. Only downsides were that the pre-brochure stated as part of the features wifi and gym. The wifi was only available at two locations both of which closed by 9pm. The charge for the wifi was extortionate, it should be free. Regarding the gym, that consists of a couple of basic manual 'exercise' machines located in the children's playground. Those two areas were not correctly outlined but otherwise the parc itself was really nice. Great site,lots of space,excellent facilities. When we arrived, the keycamp couriers could not find any booking reference and we had a delay whilst they 'found' a suitable mobile. The campsite itself was very good. Superb parc, lovely location, brilliant set up and great service from eurocamp. Thank you. This is the second time we have been to this parc, and we will very likely return next year. The couriers were extremely helpful, and the accommodation was very clean. Owing to work committments, we had to book right at the end of the english school holiday season. the days leading up to the 1st of september we had plenty of things to interest us, however once the 1st arrived, things that the children had been planning to do changed days and times and we were unable to do them. lesson for next time I think. hopefully going again, but one week earlier! Good parc although it was very busy and some of the things that had been free at our last keycamp site (eg tennis) had to be paid for. A great holiday location for entertaining younger children (pre teenager) and relaxing for parents. Fantastic parc with something for everyone and children of all ages. Safari tent was so comfortable and the electric woodburner, candles, a glass of red each night, made stargazing bliss! restaurant good, on-site facilities the best we've encountered. We have known friends return year on year - now we know why. I'm fussy, almost pedantic, have children aged 7 and 3 who both loved it. For me, I can honestly say it was the most relaxing break i've had since I visited thailand pre-children. Can't wait to return! We are a family with 3 children age 1,4 and 6. We found the camp and accomodation spotless and perfect for our needs. Lovely big deck. Great family friendly safe facilities. Pool complex ideal for our age kids. Great playground. local beaches lovely with free parking right next to beach. Enjoyed parking at la chume and getting quick cheap ferry to les sabbes beach. Food at resort restaurant v good quality. . only comment is camp could make more reminders to stop usual pain of guests reserving at pool and disappearing off. However must stress - this was not real problem as I think most people were polite and did not do this. Also so many beaches to go to - we hardly found time to go to pool !!! Had a really fantastic week - too much to do on site, couldn't fit everything in. Not only situated in a great area but lovely pools,lots of outside space, beautiful lake - even the campsite retaurant produced the most amazing food. Will return next year i'm sure. The key camp couriers were not in the same league as those last year. My children attended for one session on the first morning of the holiday and I hung around to see how they were getting on. I was very disappointed to see the couriers sitting and talking amongst themselves and then one to start reading the newspaper. There was little interaction with the children. I removed my children from the sessions and they didn't attend any other sessions as I wasn't convinced of the quality of the activities and the supervision being provided. Unless other parents stayed around they would not have been aware of lack of supervision. Excellent holiday yet again at la garangeoire. eurocamp service excellent. a great relaxing way to spend two weeks back to basics. did not need a watch the whole time. It was an absolutely brilliant holiday and I would recomend it to anyone. Everyone from reception staff to bar staff to the night secruity were really helpful and friendly and the parc was beautiful I will def be going back! Beautiful campsite, great facilities. Wish we had stayed for 2 weeks rather than 1.